NHS-hater Paul Nuttall elected to lead UKIP. How long will this one last? Paul Nuttall outside the Emmanuel Centre in London moments before he was announced as the new Ukip leader [Image: Stefan Rousseau/PA]. 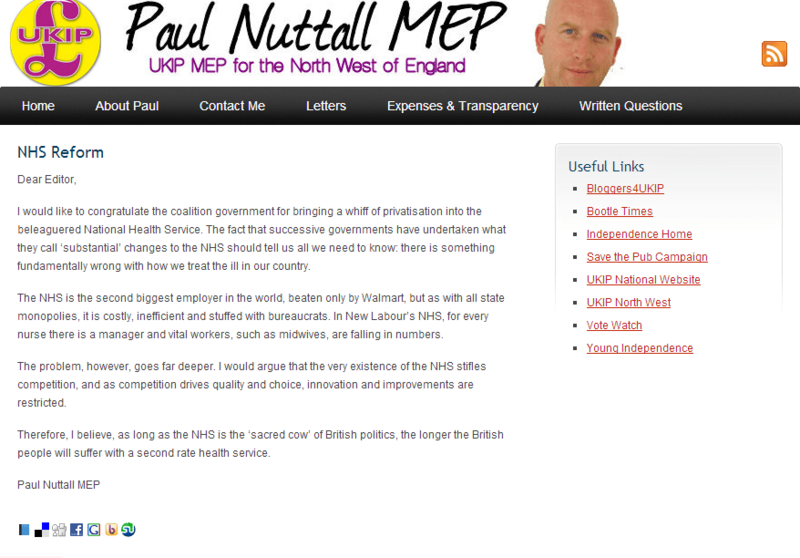 The only piece of information you really need about Paul Nuttall is that he wants to privatise the NHS completely. He published this information on his website a few years ago, then took it down when he realised it was unpopular with the general public. Fortunately, some of us made screen grabs so it could be kept for posterity. 1. Has strongly supported Farage’s “Breaking Point” billboard [which showed a snaking line of – allegedly – immigrants on their way into the UK]. 3. In a speech in the European Parliament Nuttall labelled the response of the EU to the refugee crisis as “freedom of movement of Jihad”. 4. He wants to ban the burqa [an act that would prohibit people from coming to the UK on religious grounds]. The Guardian‘s claim (below) that Mr Nuttall’s election marks the end of UKIP’s troubles seems premature. The previous leader, Diane James, lasted just 18 days in the job before leaving due to a lack of support. Mr Nuttall seems to be trying to prevent a repetition of this kind of PR disaster by creating one that is unique to himself: He told members that, if they did not support him, they would be booted out of the party. 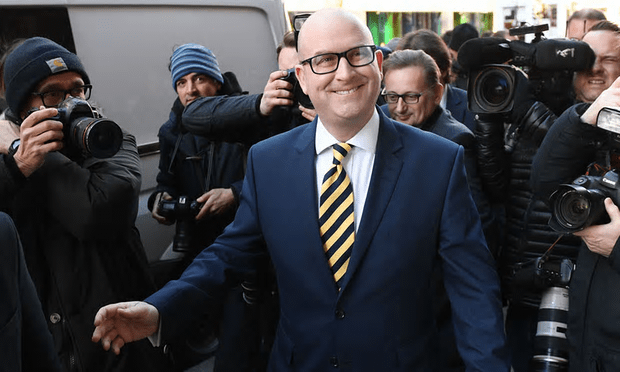 Paul Nuttall has been elected by Ukip members to replace Nigel Farage as leader, ending a turbulent period for the party after the referendum to leave the European Union. Nuttall, the former deputy leader, was elected with 62.6% of the 15,405 votes cast. His presumed nearest challenger, Suzanne Evans, won just 19.3% of the votes, only 200 more than the rank outsider, John Rees-Evans, who won 18.1%. The MEP for north-west England takes over from Farage, who had returned briefly as interim leader in October when his chosen replacement, Diane James, stepped down after just 18 days in the job, citing a lack of internal party support. Speaking at a party event in London after being announced as leader, Nuttall called for unity following tumultuous months for the party. He told members that if they did not wish to unite “your time in Ukip is coming to an end”. Postscript: I understand the BBC broadcast live coverage of the election result. Some commentators have questioned this but I think it was the right decision. UKIP may have only one MP, but it had 12.7 per cent of the vote in the 2015 general election – more than one-third as many as the Conservatives, who won. That is a significant amount and should be respected. Besides, if we show people what UKIP really is, they might stop voting for this far-right pressure group. he sound like trump so should go far ? It may be his view, but it is not the view of the party, like every party it’s members have different idea but UKIP debates them it doesn’t just say this is what we will do and ploughs on regardless.